Mark Teaches Hawaiian Slack Key in Seattle! « Mark Teaches Uke in Seattle! 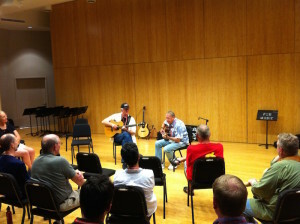 Mark continues his day at Dusty Strings with a Hawaiian Slack Key guitar workshop. (Mark’s book on the subject is still in print after 15 years!) He will cover Open-G and C Mauna Loa tunings, and teach you Keo la Beamer’s “E Ku’u Morning Dew” and his own “Spouting Horn.” All fingerpickers welcome. Come tuned to “Taro Patch” (Open-G) tuning: DGDGBD, low to high. To register, call Dusty Strings at: (206) 634-1662.